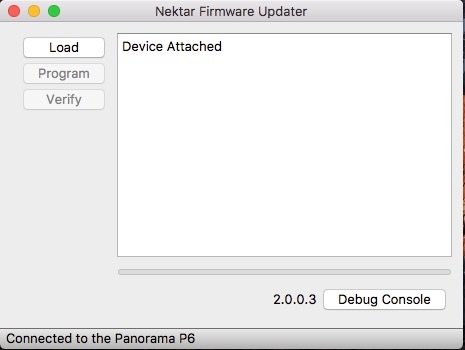 After running the Panorama Installer, you have all the components you need in order to update the firmware in your unit. Connect Panorama to your computer and set the power switch to off. Hold down the [Toggle/View] (just above Fader 9) AND [Mixer] (above the display) buttons on Panorama WHILE turning its power switch to On (P1 does not have a power switch so plug the USB cable in while pressing the two buttons). The Panorama display should now be white. The firmware update app nkupdate should now look like Image 1 showing “Device Attached”. Press the ‘Load‘ button in nkupdate. Select the firmware and click ‘Open‘. The updater window will report “File Loaded”. Click ‘Program’ button to begin the update process. Once complete, you should get the message “Programming success”. 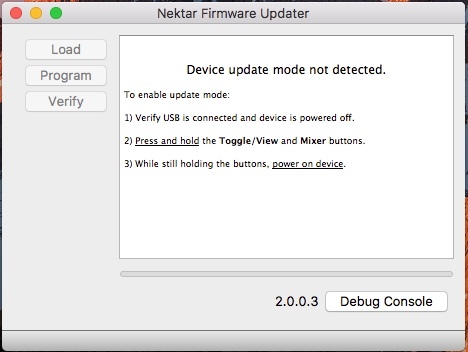 Close the firmware updater app. Set Panorama’s power button to off. If you own a P1, unplug it and plug it in again. On P4 & P6 you do that by holding down the Patch-/+ buttons WHILE powering on the unit. On P1, disconnect and reconnect, then press the [Cycle]+[Record] buttons. You then have 2 seconds to press the [Patch-] and [Patch+] buttons. Keep holding the patch buttons until you see the fader display on Panorama. your user memory banks; please do a backup, and restore after resetting. The DAW support file you downloaded from the ‘My Downloads section also contains as ‘Firmware’ folder. In that folder you will find an application called nkupdate an a .bin file, which is the firmware file. These are the files you need to update Panorama’s firmware. It’s important to complete every step so please follow the instructions below carefully. 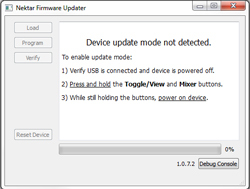 The firmware update app nkupdate should now look like Image 4 showing “Device Attached”. folder, included in the file downloaded from Nektar’s website. See Image 5. Select the firmware and click ‘Open’. The updater window will report “File Loaded”. start Panorama in update mode – as detailed in earlier instructions. 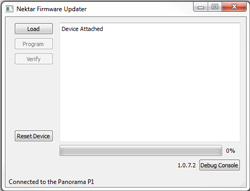 After running the Panorama Installer, you have all the components you need in order to update the firmware in your unit. After placing the nkupdate application in your Applications folder, please follow these steps.